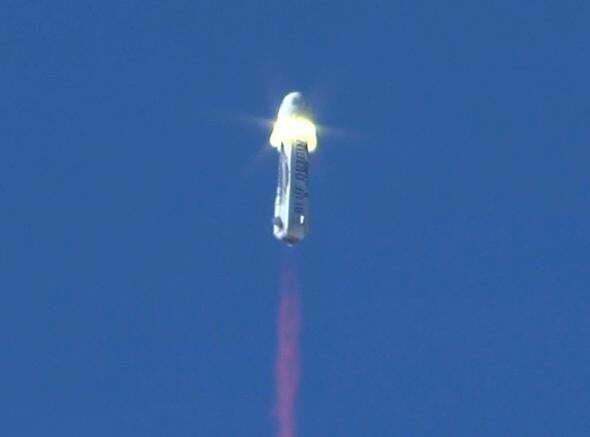 Blue Origin tests capsule escape system during flight. The moment of separation, when the rockets under the crew capsule ignited. On Wednesday, Blue Origin had a helluva day. After a handful of short holds, the company’s New Shepard rocket lifted off for the fifth time from the Texas desert proving grounds, heading up into space. Like the previous four test flights, this was to be a short suborbital hop: Straight up, pass the 100 kilometer line that demarcates the arbitrary but agreed-upon border of space, then back down to land vertically again. But even for this rocket, this was no ordinary flight. As I wrote earlier in September, this test flight had pretty good odds of being the last time we’d see this five-time booster intact. The reason was that the crew capsule’s emergency abort rocket was to be tested in flight. Roughly 45 seconds in, when New Shepard was undergoing maximum pressure as it rammed through Earth’s atmosphere, the powerful rocket motors along the bottom of the crew capsule would ignite, blasting it away from the booster underneath. This abort system is set up in case there’s a problem during the flight, and the crew needs to get away fast. It was expected that this escape procedure might destroy the booster, kicking it sideways or otherwise putting huge stress on it. Full of fuel and off-balance, it might have exploded or fallen to the ground to explode there. Holy wow! At T+45 seconds, the rockets kick in and the crew capsule roars away. Amazingly, the booster hardly even notices; it just keeps on thrusting up, up, and away. The crew capsule had a bit of a wild ride, oscillating almost upside down at one point after the rockets under it quit, but soon enough the drogue ’chutes popped out and it stabilized, and then the main ’chutes opened to give it a smooth ride down to the ground. Then, amazingly, the booster comes back and lands on its tail like it was no big deal at all! That was stunning to watch. Moments after separation the capsule blasted away from the booster below on a tail of fire. It’s hard to overemphasize how important this was. For one thing, no other rocket on Earth has been launched into space and landed on its tail five times like this one. For another, there hasn’t been an emergency escape sequence like this tested since the Apollo days in the 1960s! 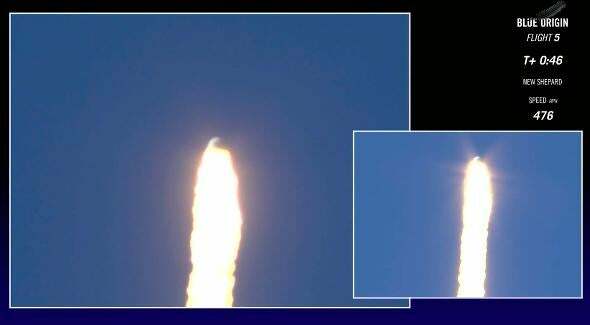 For a third, this shows that Blue Origin can have an emergency escape and retrieve both parts of the rocket safely. Altogether, that’s a pretty big deal. Blue Origin just showed the world that it can make big plans and execute them. I’ll note that until very recently they were very secretive about their work and even their launches, not releasing information until after the tests were done. Their holding live webcasts now shows just how confident they are on their path. And their path is big. I wrote about Elon Musk and SpaceX’s plans to go to Mars just last week. But not long before that, Jeff Bezos released Blue Origin’s plans to build much bigger rockets. Their New Glenn rocket will be quite capable of achieving orbit. Note the names of the rockets: Alan Shepard was the first American in space, on a suborbital flight. John Glenn was the first American to orbit the Earth. Bezos also said the next line of rockets after New Glenn will be the New Armstrong. I wonder what his plans are for that …? Blue Origin is creating a new rocket engine, the BE-4, which is very powerful. Seven of these will power New Glenn, which will make it a rival of SpaceX’s Falcon Heavy. Both companies have plans for bigger and more powerful rockets yet. Both have their sights set on getting out of Earth orbit, and into interplanetary space. I’ve said this before, and I’ll say it again now: People say it’s a curse to live in exciting times. Those people are wrong. Congratulations to the folks at Blue Origin! As you say: Gradatim Ferociter!